A wild snow storm had hit the area welcoming in the New Year. This was followed by a quick thaw and consequently the Ouse flooded during the night of the 2nd January. The river rose rapidly the next morning, rising in the city at a rate of 1 foot per hour. Heavy rain then fell, clearing the remaining snow. The following day, the water rose to 9 feet above the summer level; by the 4th January, the flood was subsiding. At a meeting of the York Joint Board of Guardians, the Workhouse Master reported that 100 vagrants had, during the month, returned to the Union the same day as they were discharged and occupied the tramp ward. The Workhouse Committee, therefore, resolved that in all cases during the winter months where vagrants returned on the day of their discharge, they should be served with bread and water instead of gruel. Bishopthorpe Poor Law Guardian, John H. Shouksmith. From 1834, Poor Law Unions were run by Boards of Guardians. Bishopthorpe came within the York Union – the Workhouse was in Huntington Road. The village ratepayers elected as their Guardian, Parish Council Vice-Chairman, John H. Shouksmith of The Laurels, Sim Balk Lane. He ran a substantial plumbing business in Micklegate, York. The York and Ainsty Hunt to meet 12 January at Naburn Ferry at 10.45 a.m. The sociologist, businessman and Quaker, Mr. B. Seebohm Rowntree, gave “a most able and deeply interesting lecture” on “The Evils of Betting and Gambling”, in the large hall at Bishopthorpe Palace. The event was hosted by Archbishop & Mrs Maclagan. In 1901, Seebohm Rowntree published, Poverty: a Study of Town Life, based on the poor of York, and four years later in 1905, he edited the publication, Betting and Gambling. In his talk, which was warmly received, Mr. Rowntree suggested that gambling was the effect of underlying causes. He argued that what was wanted were better living conditions and increased wages so that men would be enabled to live a life of adequate fullness. One thing that would have a great effect would be to give men better housing with gardens. He felt that every town should have an anti-gambling society, and that meetings should be held to expose the folly of those lads who put their “bob” on horses. Bishopthorpe vicar, Rev. 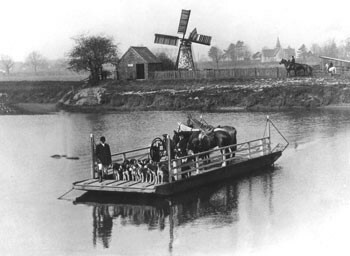 Pennyman, expressed thanks to Mr. Rowntree and said he hoped they would be able to tell him some day soon that they had an anti-gambling society in Bishopthorpe. It was announced that for the first time a Special Rate had been ordered by the Rural District Council. This it was explained was to defray the cost of erecting air shafts to the parish drain [in Main Street]. The Archbishop of York’s School was closed for three weeks on account of an outbreak of diphtheria in the village. Dr. Raimes, the District Medical Officer reported to the Bishopthorpe Rural District Council, that the death rate for the district in January had been 24 per 1,000 per annum. There had been two cases of diphtheria in Bishopthorpe and both were removed to Acomb Fever Hospital. Dr. Raimes had to close the building because one of the patients was a child who attended the school. The parishioners of Bishopthorpe erected a cross to the memory of Canon J. R. Keble, who had died four years earlier in February 1903. Rev. 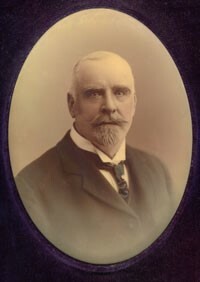 Keble was vicar of Bishopthorpe from 1891 until his death at the age of 46. His grave was situated beneath the east window of St. Andrew’s Church, where the eight-foot carved cross was placed. 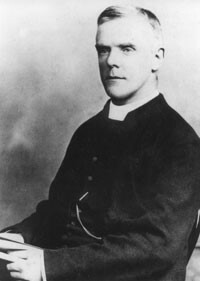 A chaplain to, and long-standing friend of Archbishop Maclagan, he also wrote the History of the Parish and Manor-House of Bishopthorpe, which was published posthumously in 1905. Canon Keble’s wife, Florence, wrote to St Andrew’s churchwardens thanking all her friends at Acaster and Bishopthorpe for erecting such a “beautiful” cross on her husband’s grave. The designer was York sculptor G. W. Milburn. Pictured in our illustration is a smart little walking costume for the New Year. Though warm and cosy and quite suitable for immediate wear, it is built on lines which will permit of its doing duty right through the spring without any appearance of unreasonable weight. The material employed in its construction is a smooth blue serge. The little coat is of the semi-fitting short-waisted type. From the neck turns back a little dark blue velvet collar, which is edged with a wide band of heavy silk braid. Bands of similar braid are placed down the front of the coat and finish the velvet cuffs of the sleeves. 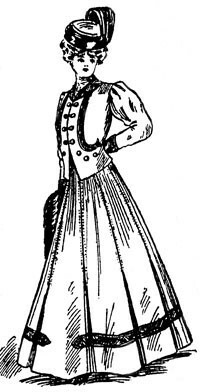 Just at the waist line in front, the coat opens slightly and displays a peep of braided waistcoat. A good plan for holding out a rather heavy skirt after being washed is to peg it by the waist on the line, then get an old umbrella (crooked handle is the best), open it out and hang on the line in the space between the pegs. Spread the bottom of the skirt all over it pushing the points of the ribs up a little to prevent working through the skirt. This keeps the skirt open and lets the air through the material, and also keeps it in good shape. To keep not only the frost, but the chill night air out of your bedroom, office, or workshop, procure a common penny paraffin lamp at the oilshop. Place this alight in a six-inch flower-pot, and invert another flower-pot upon that one. Both will become hot, and will keep the room cosy during the bitterest night. There will be no smoking of the lamp, and it is very inexpensive. ← The Archbishop, the Chapel Goods – and Mrs. Newton!